Like millions of people here and around the world, we woke up this morning dismayed and frightened that Donald Trump has been elected President. Whatever we each thought of the Democratic Party and of Hillary Clinton, none of us wanted to believe that a plurality of voters could bring themselves to vote for Trump. His victory is part of a global pattern of an ascendant, populist right, following in the wake of the similarly unexpected vote in favor of Brexit in the UK, and, like Brexit, it is being celebrated by right wing nationalist leaders in Europe like Marine Le Pen. 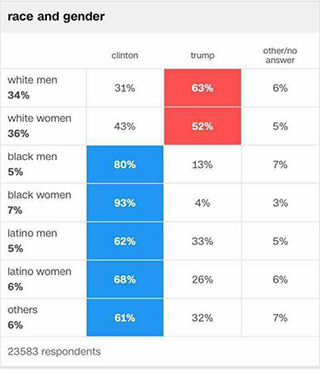 Exit poll data broken down by race and gender. The outcome of the election is, no doubt, in part an expression of white supremacy. But it’s more than that: many commenters have already pointed out that the rustbelt battleground states that arguably cost Clinton the election were areas where Obama performed significantly better among white voters in 2008 and 2012 than Clinton did in 2016, complicating any suggestion that the results are simply about the racism of white voters. The fact is that the neoliberal politics of the ruling class have been devastating the lives and communities of working people all over the country and the world for decades, and Hillary Clinton is justifiably seen by many as the embodiment of that ruling class establishment. For many white people, the resentment this generates takes the form of racist and xenophobic anger, but its root causes are broader, and to overcome the racist backlash the left has to legitimately address those root causes. Tragically, as the Republican establishment have lost control of their party to Donald Trump’s right-wing populism, the Democrats have doubled down on the neoliberal center. The DNC used every tool they had to ensure that Bernie Sanders–a populist candidate who in almost every match up poll performed much better against Trump than did Clinton, and who addressed many of the same economic insecurities that Trump has fed on–was unable to gain the nomination. Having undemocratically paved the way for a candidate that almost nobody actually felt good about, the Democratic Party proceeded to campaign to their right, taking the votes of the left and of people of color for granted and instead seeking to win over conservative voters. There’s some evidence that the DNC even encouraged a Trump primary victory on the assumption it would make for an easier general election victory by allowing the Democrats to capture less racially motivated conservative votes. Meanwhile, the Green Party–the most visible alternative to the left of the Democrats–seems to have won less than 1% of the vote in the Presidential race; a result both disappointing to those seeking to build the Greens as a party of the left, many of whom named 5% of the vote as a goal, and totally insignificant compared to the numbers of Democrats and independents who either stayed home or, worse, jumped ship to vote for Trump. Simply put: there is a vacuum on the left of US politics. No serious analysis could conclude that the presidential wing of the Democratic Party represents anything more than, at best, a calculated neoliberalism with a human face. It is precisely these politics which have generated the mass popular discontent we see among all demographics and all parts of the political spectrum. To promote “more of the same” and diminished expectations as a solution is to provide no solution at all, and the absence of any left alternative has ensured that discontent has instead been channeled to the right, at least in electoral terms. We have to defeat the far right agenda of white supremacy and nationalism that Trump represents. Our lives literally depend on it. But the only way to defeat the right is by building the left. We can’t win this fight by building greater unity behind the ruling class’s chosen candidates and their neoliberal agenda; even if the fear of something worse had mobilized enough people to deliver a victory to Clinton in this election, or even if it does so for someone like her in 2020, that would merely kick the can down the road while the right continues to grow stronger. It would not build the power we need to win and to build a better world. To do that, we need to organize. We need to build truly independent political power that can give the left a means to meaningfully intervene in electoral politics, beginning at the local level; the Richmond Progressive Alliance–which yesterday won three local races to gain a supermajority in the city government of Richmond, CA–is one example of what this grassroots electoral power might look like. (One way to get involved in this work is to attend the Left Elect conference in Chicago, March 3-5, 2017.) The defeat by a teacher union led coalition of a massively funded ballot initiative seeking to expand charter schools in Massachusetts is also an encouraging example of what we can do when we organize against the neoliberal privatization agenda. We need to support and build the Movement for Black Lives, the efforts fighting in solidarity with the Standing Rock Sioux against the Dakota Access Pipeline, immigrant rights groups, and other organizations that can build the power of the people most vulnerable to Trump’s agenda and to violence from his far right supporters. It’s also vital that we build renewed working class organization, such as rank and file led social justice unionism but also including new and innovative forms of organization, that can unite workers through class solidarity and break the influence of racist right wing narratives on the white working class. Finally, we need to build revolutionary organization. The ultimate solution to the terrifying array of forces we face in the world today can be nothing less than the overthrow of capitalism and the systems of white supremacy and heteropatriarchy that prop it up and shape its impacts. We won’t win a socialist world without socialist organization. We strongly encourage everyone committed to fighting for a just world to find, join, and help build a revolutionary organization, whether that’s Solidarity or another group. Today, we are all afraid of what comes next, and we all need to check in with our friends, family, and comrades to ensure our emotional and physical wellbeing. But we can’t afford to wait until tomorrow to rebuild a vibrant, anti-capitalist left capable of fighting and winning. We wholeheartedly agree with the words on so many lips today: don’t mourn, organize. This statement is available as a front-and-back PDF flyer: download here. This election has made me loose hope in the egalitarianism of this country. Solidarity was missing prior to the election. Many Bernie supporters balked at following Bernie’s advice. Solidarity was needed to vote against Trump. Misjplaced protest votes failed to understand the absolute gravity of this election. Trump is not smart enough to run this country. The cohorts he appoints are going to run him and their agenda will become America. I’m all for solidarity. HOW IS IT GOING TO BE ACCOMPLISHED? I will forward and repost this article with hope. But it should have been done already!